This artist's concept shows NASA's New Horizons probe cruising near Pluto during a close approach scheduled for July 14, 2015. NASA's New Horizons probe is about to wake up from a long slumber and get ready for its highly anticipated Pluto flyby next summer. New Horizons is scheduled to emerge from a 99-day hibernation on Dec. 6, then gear up for a six-month Pluto encounter that peaks with the first-ever close flyby of the mysterious dwarf planet on July 14, 2015. New Horizons launched in January 2006. The spacecraft has spent about two-thirds of its long flight to Pluto asleep, over the course of 18 separate hibernation periods that ranged from 36 to 202 days in duration. Keeping the probe dormant so often has reduced wear and tear on New Horizons' electronics and kept operations costs down, mission officials said. New Horizons went into hibernation for the final time on Aug. 29 of this year. When the robot wakes up early next month, the mission team will check out its operating systems and science gear, and devise and test the command sequences that will guide New Horizons on its historic flyby of Pluto and its five known moons. The Pluto encounter technically begins on Jan. 15, 2015. Over the next six months, the spacecraft will use seven different science instruments to study the geology and topography of Pluto and its largest moon, Charon, map the two objects' surface compositions and temperatures, study Pluto's atmosphere and search for undiscovered moons and rings in the dwarf planet system, among other things, team members said. 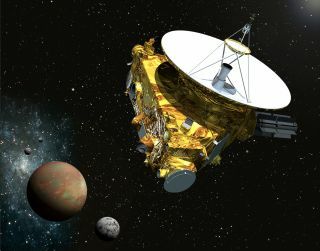 "The final hibernation wakeup Dec. 6 signifies the end of an historic cruise across the entirety of our planetary system," said New Horizons principal investigator Alan Stern, of the Southwest Research Institute. "We are almost on Pluto’s doorstep!" The Pluto flyby may not mark the end of New Horizons' work. Mission team members want the probe to zoom past another object in the Kuiper Belt — the ring of icy bodies beyond Neptune's orbit — and have spotted a few good candidates using NASA's Hubble Space Telescope. That post-Pluto flyby would likely occur in 2019 if NASA grants funding for an extended mission, Stern has said.